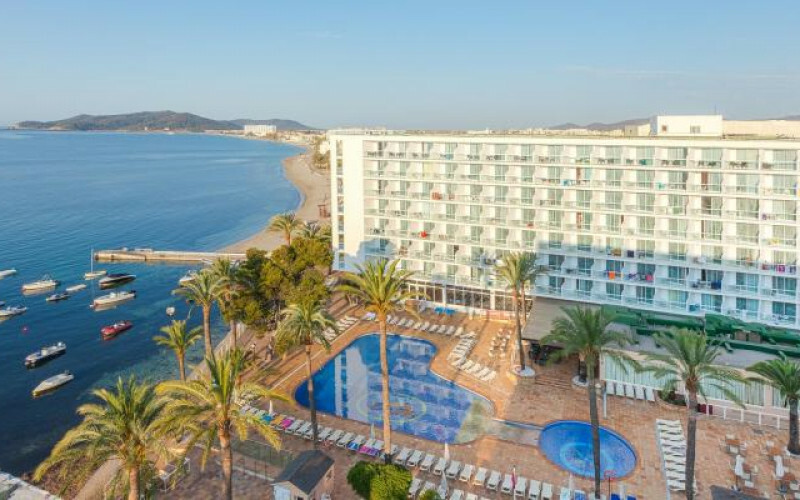 The Sirenis Tres Carabelas Hotel is located on the beachfront of one of the most popular resorts in Ibiza and has created a joint complex with the Sirenis Goleta & Spa Hotel so that guest can enjoy double the facilities. The multilingual staff at the 24 reception desk are available to offer services such as luggage storage for guests that have a late flight home, postal service, business support, chargeable laundry service, currency exchange and tourist information. There is a car rental on site if you are thinking of exploring the rest of the island, and they can also offer motorbike & bicycle rental. Another great way to get around the island is by bus and the bus stop is just outside the hotel. Being on holiday with the whole family can be a stressful time. If you think you need to relax, then the wellness centre and beauty salon is just what you need. There is a heated swimming pool, Jacuzzi, sauna, a hydro-massage pool and many more ways to unwind and relax that are free to all of the guests staying at the Sirenis Tres Carabelas Hotel and the Sirenis Goleta & Spa Hotel. The complex has an extensive amount of sporting facilities to keep you fit and healthy including table tennis, 3 tennis courts, 4 paddle courts, billiards table and there is also a gym for those wanting to keep up with their fitness schedule. If you want to try water skiing or have a ride on the banana boats, this can all be done on the beach of Playa d'en Bossa, which is just a few minutes' walk from the hotel. The hotel has a large pool that is surrounded by a large sun terrace that sits directly under the sun. Guests can top up their tans on one of the many sun loungers, whilst sipping a cocktail of two from the pool bar that is open daily to offer many snacks and drinks to keep their guest hydrated throughout the day. The buffet style restaurant is something to look forward to with their vast amount of delicious dishes on offer and meals that will suit the little holiday makers too. The evening continues with a choice of bars that have a great holiday atmosphere and the indoor bar is very popular with guest as they can sit and enjoy the carefully prepared family friendly entertainment whilst having a glass of wine. The hotel rooms have recently been refurbished and are now very modern and spacious. All rooms have twin beds, flat screen TV with satellite channels, air-conditioning, mini-bar, and a private bathroom. The private balcony or terrace is furnished with a table and chairs and most have a pool or sea view. There are many upgraded rooms, which are subject to availability and would incur an additional charge. The Sirenis Tres Carabelas Hotel offers a fun atmosphere and is a perfect choice for families and couples alike.